Frederik Ramm is wondering about the territorial waters of Gibraltar and asks for help. User Warin asks on the tagging list, whether it is better to define temperature = ° C as a standard unit (similarly, width=*, in which meters is the standard unit) or whether the standard unit should vary regionally (°F in USA, °C in Europe). According to user Littlebtc on the talk mailing list in Taiwan the coverage of the Bing aerial imagery dropped dramatically after a recent update. Nick Whitelegg wants to climb Parnassus (Παρνασσός, 2455 m according to Wikipedia) in July. This is different to Olympus (Όλυμπος, 2918 m according to Wikipedia), which mapped much worse. He asks for anyone who would like to accompany him when mapping on the 19th or 20th of July to contact him. Simon Poole has once again counted addresses all over the world, in the US and in Germany. User has nebulon42 released its SVG Icon collection designed for OSM. 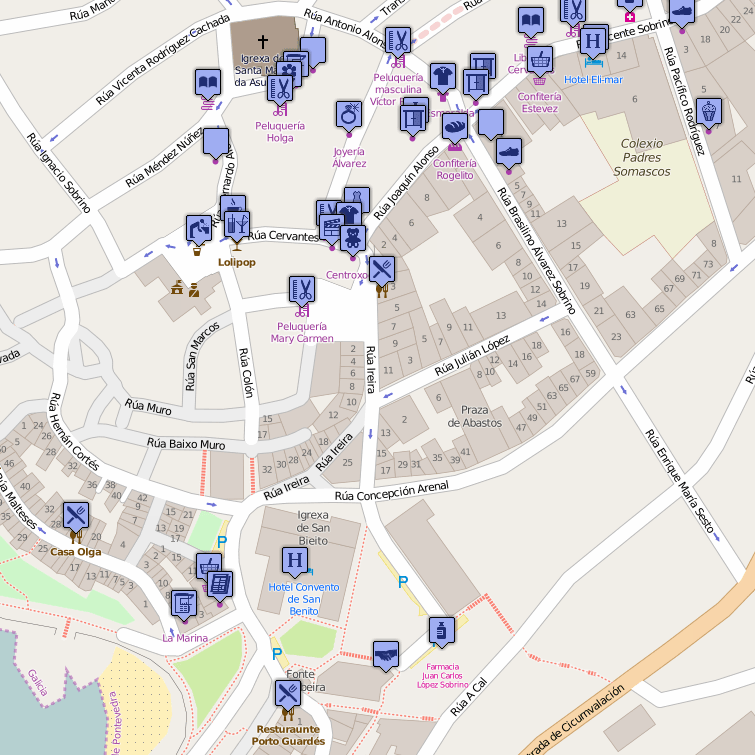 Some of these icons are currently used in the standard style maps on OSM.org. A study about the heterogeneity of the OSM data. Mark Bradley tested the import of some data of buildings and addresses in Indianapolis. There was some criticism of this afterwards. In 2010, in Peoria County, Illinois, buildings and vegetation data were imported. User bdiscoe has tried to repair this broken Import; others say in the comments that the import should be deleted. In the USA, 96 percent of the addresses are currently missing. User omnific speaks in his diary in favour of importing the missing addresses from the TIGER data sets. Several commentators see it differently. Dermot McNally published on OSMF talk a draft for “OpenStreetMap values” and asks for feedback. It was suggested to lead the debate on a larger scale with the community. The agenda for the Annual General Meeting of the Swiss OpenStreetMap Association on April 18 in Nidau was published. The website for the State of the Map 2016 is online. The Call for Location ended on April 15. Read the bids from Montreal, Brussels and Bucharest. Humanitarian OpenStreetMap Team (HOT) is to hold its Inaugural Summit in Washington, D.C. HOT says farewell to Kate Chapman. Pete Masters asks the HOT list how to tag mission stations and houses of worship. A pull request by Tobias Preuss adds collection times to the Briefkastenkarte (mailboxes map). The police in Scotland use OpenStreetMap. The Chilean military use OSM maps in the flood-hit areas in the north of the country. In MapBox’ blog Tom Lee reports on the National Address Database Summit, a meeting of the assets and interested parties around OpenAddresses. Apparently no one is interested whether or not Apple used OSM data without a license. Do you remember how great the outcry was at the time (2012)? Dennis Luxen retires as the maintainer of OSRM. GraphHOpper can handle real-time traffic data. … the map with the opening_hours osm24.eu? Average number of languages spoken in the EU.